Review: Wileyfox Swift – the Moto G killer? 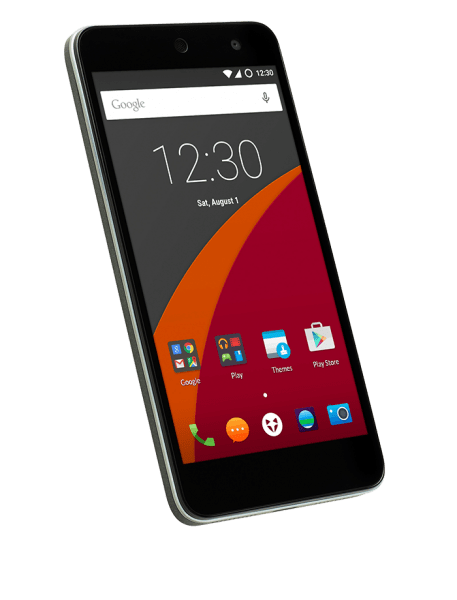 Wileyfox recently made the headlines by introducing themselves as the first British company to manufacture and sell smartphones, both in the UK and elsewhere. Their business model is simple, sell good phones at great prices, and they will come. So far, there are two phones on offer from them, the Wileyfox Swift (at £129!) and the Wileyfox Storm (£199, not yet released). At such low prices, and very impressive specs (read on), these phones not only provide a very healthy competition to the mid range phones, but also the ultimate champion in that category, the Moto G.
The phones though, differ on one main aspect from the usual, as in they offer Cyanogen OS, instead of Android. In many ways Cyanogen is more vanilla than vanilla Android, giving you options to make tweaks and changes things in a way that even basic Android doesn’t. On paper, all the specs are directly in line with the Moto G, but at a price around £50 quid cheaper. At the time of writing, the Moto G was on sale for £179.99. This may be me being stuck in the former years, but I quite like how the Wileyfox Swift looks and feels compared to your usual flagships. The soft matte finish at the back gives you both a nice feel and a great grip, and the little fox logo at the back does exactly what the M in the Moto phones does, gives you somewhere to place your finger when you use your phone, and somehow that helps form the bond! Overall though, the phone is a fairly standard build, the screen in front with a circular ear piece which is about 0.5mm receded in the case, and an LED which is extremely bright sitting next to it on the top, along with the front camera. 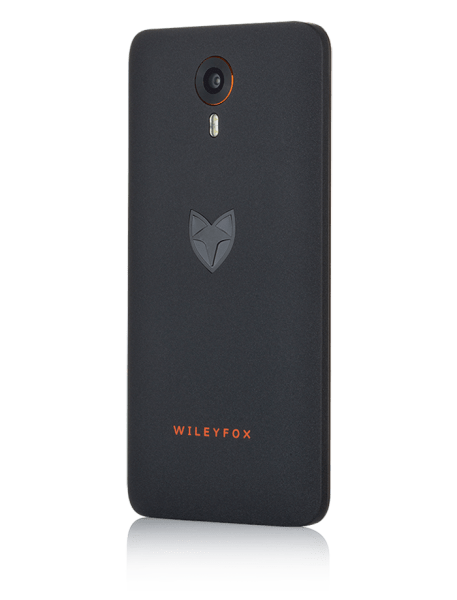 The right side features the usual positions of power and volume keys, while the back has the camera, the flash, and the Wileyfox logo as well as name in lovely orange. Prize open the back, which is very easy to do, and you see the removable battery, as well as the two micro SIM slots and the SD card slot. It makes a pleasant change to see an easy to pop in SIM after all the pin hole SIM trays we have been dealing with. You still need to pop the battery out to put the SIM in or out, so that is still a minor annoyance. Overall though, it feels good, it feels solid and rugged, and definitely does not feel cheap. For the uninitiated, Cyanogen OS is not unlike many other skins that different companies put on top of Android phones. Though while other companies such as Samsung, Huawei and LG make an effort to generally dumb down the Android experience, Cyanogen achieves the exact opposite, giving you plenty of customization settings, and many little widgets and things to play with. All in all, it is a fairly interesting experience, if not pleasant. However, you will notice as you download and install apps that they will give you a warning about running them on Cyanogen OS, and interestingly, I noticed that my Basis Peak (a fitness smartwatch) stopped vibrating for notifications when I was using this phone. If you haven’t played with Cyanogen, it is definitely one to try out, specially if you prefer the vanilla Android experience, like that found on the Nexus phones or the Motos. If you rather have Samsung or Huawei skin your Android, this may be a bit raw for you. It also adds some other interesting features, such as TrueCaller support for unknown numbers, allowing you to block unwanted calls, as well as the ability to search and find who is calling you as they call you. Cyanogen is also built around privacy, which means your whole phone experience should be a lot secure. It is not often that I mention the LED on a phone in such detail, but the one on this phone is extremely bright. So much so that at night when I was charging the phone, I could see a bright spot on the roof directly above the phone. The little bit of recess and high brightness achieves that. You can turn it off, of course, if it bothers you. This is where the phone begins to disappoint a bit. Feels good, offers a lot, but somehow, and I am not entirely sure why, the performance has clear signs of sluggishness. I am not sure if the OS gels well with hardware, or what, but the phone definitely has a slowness about it. The fact that this has the same specs as Moto G, which runs smooth on Android makes this one of the disappointing aspects. But it is not all bad, what this suggests to me a software upgrade or two may just sort the whole thing out. Or it may just be the higher security protocols on act in the background, which may be eating away the processing power. Another downer for me, I am afraid. On a usual day (and yes, I am a heavy user), the battery didn’t last very well, and by the time I plugged this in, it was down to 1%, and I had only got home from work. This was around 10 hours later, which is bad. I tried the various power saving options available, but the battery life seemed disappointing. Most of it is being eaten by the screen, which is obvious. The same pattern roughly repeated itself over the next few days. The camera is mostly decent, though it struggles in low light conditions. The flash does make up for it at times, but obviously leaves its own tint on the images. Dual SIM capabilities are highly under rated, and I am surprised we still don’t get that as a standard in most phones, if not all. Or at least the flagships! Well done on Wileyfox for adding this as a standard, and I can report that it works very well. So, do we have a Moto G killer? No, afraid not. In many ways though, this is an unfair fight. Yeah, on paper they look the same, but on your bank statement, they look rather different. Moto G is about 50% more expensive than this! Is it worthy of its price? Oh, definitely yes. It is available from the likes of Amazon (Wileyfox Swift 4G Dual SIM) where it retails for £128.99, including Free Delivery. The Wiley Fox website also offers services such as free screen replacement for £9.99 a year and a three year warranty for £9.99. Not many phones have put my mind at such a conflict as this has. I love how this feels, and even more so, the moment you look at the price, you really can’t complain. Then you play with it and find it a tad slow. In many ways, the good look and feel almost makes you expect more than what you have paid for. That is the Achilles heel of this phone, and that my dears, is pure good old fashioned British irony!